Support for NC SPIN comes from the financial support of trade and professional groups, corporations and foundations in the form of production underwriting. Each underwriter is entitled to on-air acknowledgements consistent with public broadcasting guidelines and according to the level of support, however the number messages is limited. Each message must be approved by and contracted through UNC-TV. UNC-TV is North Carolina’s only statewide television network, with four channels broadcasting over 12 over-the-air stations that cover 99.3 of the television households in North Carolina. 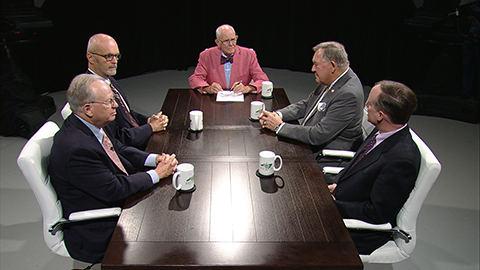 NC SPIN airs of the main UNC-TV channel Friday night at 7:30 p.m. and Sunday afternoon at 12:30 p.m. In addition, the program airs on UNC’s North Carolina channel Friday night at 10 p.m., Saturday at 4:30 p.m. and Sunday morning at 10:00 a.m. Weekly and previous programs can also be streamed is video streamed at video.unctv.org or on www.ncspin.com. Carolina Broadcasting and Publishing, Inc.